Summary : This is a superb green tea...full of flavorful and very tasty tropical flavors. If you want to bring the tropics home, and have your healthy antioxidants too, then this tea is a tasty way to do it. Review : Will winter ever end? It is March. It is cold. It is snowing. And winter is suppose to go on and on and on. So being discouraged about the seemingly unending winter, I dug around my tea selection for something that would bring back the comfort of warmer times. And the tea I selected for this tonight is a tea from the Mighty Leaf tea company called Tropical Green Tea. This was the first tea I've tried from Mighty Leaf. I knew simply from the price that this bagged tea was a premium bagged tea. However, I had no idea how premium this tea was! You see, for all intents and purposes the bagged tea from Mighty Leaf are really loose-leaf tea leaves! The leaves in the bags are huge...and the bags themselves are huge, being very similar to the new pyramid tea bags that you see from time to time. And the result is a very powerful tea indeed. The aroma of the tea matches anything you'll find in a loose-leaf tea. And from this particular tea, the fragrance of the tropics just spills out into your kitchen...and happily made me forget about winter for a while. This tropical green tea contains the following ingredients : Green tea, natural tropical flavors, natural flavors, flower petals, pineapple bits. Here is how Mighty Leaf describes this tea : "Green Tea Tropical boasts smooth green tea leaves that harmoniously blend with sweet tropical fruits to create a sensation as uplifting as a breeze off the isle of Papenoo. A healthy and refreshing blend rich in antioxidants, Green Tea Tropical makes ideal an introduction to green tea." Well, I've already mentioned the wonderful fragrance this tea has. So...let's talk about the flavor. It's awesome...how is that? This tea simply tastes remarkably close to some tropical mixed drinks I've had from time to time. The flavor of pineapple is especially noticeable, yet doesn't dominate the tea. The traditional green tea flavor is more subtle, sort of there...lurking in the background...nicely mixing with the pineapple and other tropical flavors found in this tea. There is no bitterness in this tea. Just be careful to not overbrew it...I let the tea brew for three minutes and that was indeed the perfect time. The tea also has a wonderful after-taste...with the tropical flavors found in this tea, and especially the pineapple, lingering on the taste buds for nearly a half hour after the tea is all gone. Overall, this is a top notch and highly unique green tea. If you have never found a green tea you have enjoyed before...well...here is the tea to start out with. And if you enjoy tropical flavors, you'll immensely love this tea. Recommendation : Absolutely. This is a superb green tea, and don't let the bag fool you...this is for all intents and purposes and loose-leaf green tea tucked neatly away in a large bag. While green tea purists may not like the tea due to its tropical flavors and subdued green tea flavor...anyone who enjoys the flavors of tropical fruits is bound to fall in love with this delightful tea. Mighty Leaf teas can be difficult to find, but Amazon sells the full assortment of them in their gourmet food section. 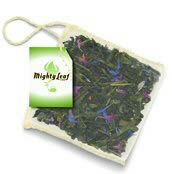 Browse selection of Mighty Leaf Teas at Amazon. Adagio Teas Sencha Overture Green Tea : A Japanese green tea with a surprisingly strong and distinct taste, but happily lacks a grassy flavor and bitterness.